Fans of Nintendo games have awesome ways of showing their devotion to their favorite company, whether it’s with a collection filled with SNES and Nintendo 64 titles; or collecting a number of stuffed Mario dolls (or, dare we suggest, Tingle from the Legend of Zelda series). 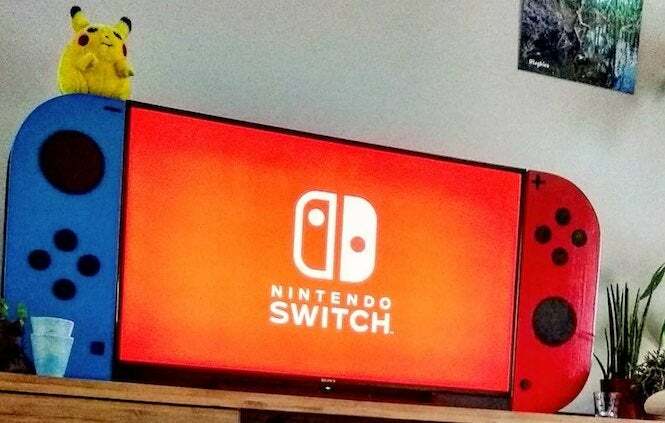 But one particular fan decided to go all out, essentially turning his television into a giant Nintendo Switch. 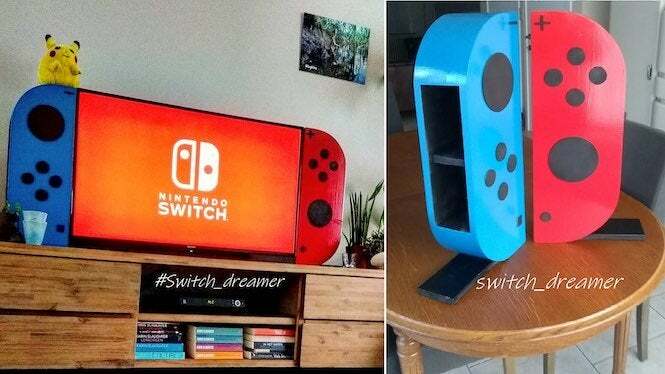 As originally reported by DualShockers, a Reddit user by the name of Logbies recently shared documentation of his project, in which he custom built two large Joy-Cons (not working, but still cool-looking) and attached them to the sides of his television to resemble a huge Switch system. The Germany-based user managed to put together the Joy-Cons by hand, which also serve as a storage unit that can hold up to 40 Nintendo Switch games right there next to the TV. So while the games may not be on display, the rest of the unit still looks cool enough that you can’t help but gaze in awe. But that’s not all. For good measure, Logbies also managed to put together a table that resembles a Nintendo Switch, right down to having a video screen. Again, it’s not playable, but it looks so cool that we can’t help but want one in our living room anyway. And those that try to prop their feet up on it will get a very stern warning, if not a full brush-off with our favorite Mario hat. Off, off! You can see the video of the Nintendo table above, on the Switch_Dreamer YouTube channel. It doesn’t appear that there’s a video yet that documents the creation of the large Joy-Cons for the television, but hopefully we’ll get one soon. In the meantime, here’s a cool behind-the-scenes photo. We can’t help but wonder what Logbies might build next. Whatever it is, though, the users over on Reddit seem to be ready for it, providing a healthy amount of feedback on his post. What do you think about these projects? Share your thoughts with me on Twitter at @TheDCD!